Get started in 15 seconds! Works on any computer (Mac or PC) and mobile devices. 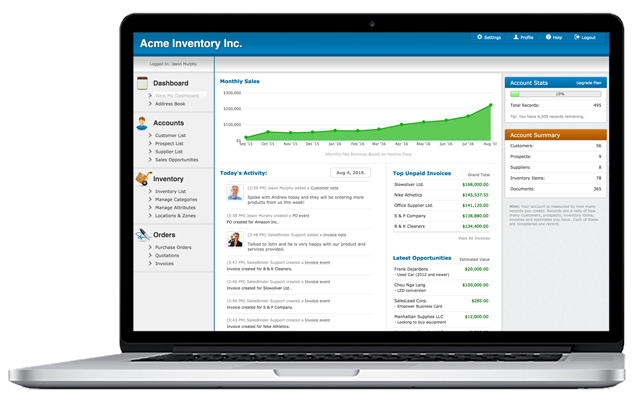 Online Inventory Management Software System in the Cloud! SalesBinder is an all-in-one online inventory management software system. Organize your customers, sales leads, suppliers, invoices, estimates, purchase orders and much more. It's easy-to-use and there's nothing to install. Get started here, it only takes 15 seconds! 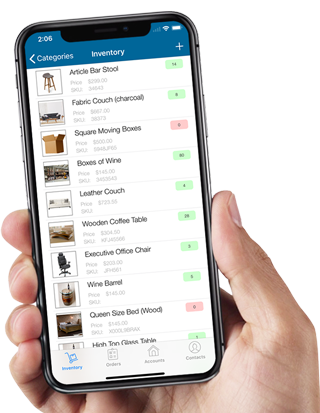 Manage your inventory and check stock levels in real-time. Receive low inventory notifications and generate purchase orders to replenish your stock. Scan inventory into your orders, generate barcodes for your documents, search for inventory or documents by scanning barcodes. Have multiple warehouses, offices, or retail stores? No problem. Easily track where all your inventory is by organizing everything into locations and zones. Organize inventory items using custom attributes such as size, color, and location. View how many you have globally or at each location. With built-in CRM features you can keep track of all your customer accounts with ease. Add multiple contacts, private notes, and review their purchase history. Create beautiful, professional invoices & estimates in just a few seconds and then instantly email them as PDF's directly to your customers or prospects. With integrated purchase orders, you can easily replenish your inventory levels by ordering more stock and even track when those new items will arrive. Generate extremely detailed reports for your inventory, sales and services. Filter your reports by date-range and category to see what's making you the most money. Custom user permissions allows you to toggle what each of your team members can see and do. Hide things, make things read-only, or hide everyone else's stuff. The SalesBinder Integrations Platform supports Intuit QuickBooks Online, Xero Accounting, WooCommerce, Zapier, and many others.